A tricky cost of doing business occurs when your business expands beyond even your own expectations. When that happens, technology that’s still perfectly useful may need to be updated—simply to ensure optimal performance. This isn’t bad news; it means you’re doing something right. Your company is growing—you need technology that can meet your evolving needs. If you’re using the PureConnect platform, adopting the more robust tools you need is simpler than ever. 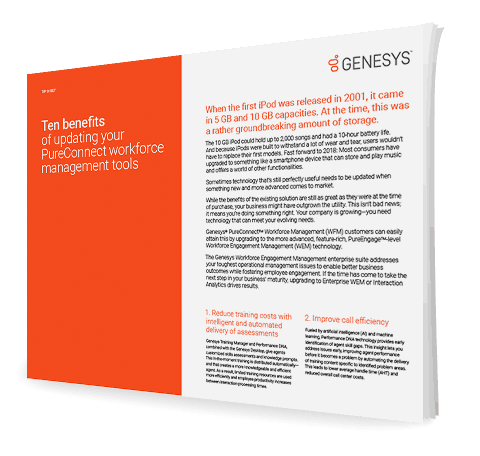 You can leverage the benefits of your existing solution, while upgrading to enterprise-level workforce management tools. This seamless transition allows you to tackle the challenges your growing business faces while enabling better business outcomes and empowering your employees.